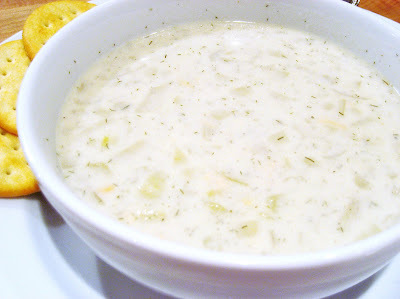 Nothing warms up a cold day like a rich creamy bowl of clam chowder. A touch of dill gives this traditional chowder a fabulous twist. You can easily purchase fresh chopped clams from the fishmonger to save time. One reason I like to make chowder at home, besides the fact that it's so quick and easy, is that I can choose the ingredients. Inspired by two of my favorite chowders: Legal Sea Foods and flavors from The Black Pearl restaurant in Newport, RI., my lighter version doesn't sacrifice a drop of creamy consistency or rich clam flavor. You won't miss the heavy cream, butter or bacon fat in this recipe! Absolutely delicious! Fresh clams already cooked, chopped and in their own clam juice. I like to cut the onions and potatoes on the smaller size and not too much bigger than the clams. In a large pot, slowly cook the onions in the butter until soft but not browned, stir frequently. Add the flour and stir for about 3 minutes, add clam broth and use a whisk to remove any lumps while it thickens and bring the liquid to a boil. Add the potatoes, lower the heat, and simmer the potatoes until tender for about 15 minutes. Stir in the clams, cream, salt, pepper, dill, and Worcestershire sauce. Let the chowder sit for 30 minutes over a low heat. Chowder is ready to serve but it's even better over the next couple of days! Tip: If you want your chowder even thicker, make a quick roux and add it to the chowder. Melt 3 Tbsp of butter in a small saute pan and add 3 Tbsp of flour and stir on medium heat for about 3 minutes until slightly colored.